Don Pedro II of Portugal, when a child, had among his little pages a modest boy of rich and princely parents. The young John de Britto — for that was his name — had much to bear from his careless-living companions, to whom his holy life was a reproach. A severe illness made him turn for aid to Saint Francis Xavier, a Saint well loved by the Portuguese; and when he recovered, in answer to his prayers, his mother clothed him for a year in the tunic worn in those days by the Jesuit Fathers. From that time John’s heart burned to follow the example of the Apostle of India. When he was fifteen years old, he entered on December 17, 1662, the Lisbon novitiate of the Society of Jesus, and eleven years later, despite the determined opposition of his family and the court, he left with twenty-seven Jesuit co-disciples for Madura. Blessed John’s mother, when she had learned that her son was going to India, used all her influence to prevent him from leaving his own country, and persuaded the Papal Nuncio to intervene. But the future martyr declared firmly: God, who called me from the world into religious life, now calls me from Portugal to India. Not to respond to my vocation as I ought, would be to provoke the justice of God. As long as I live, I shall never cease to desire passage to India. His ardent desire was fulfilled. 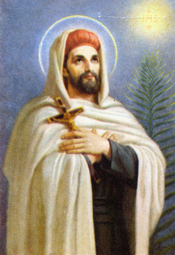 He labored in the Jesuit province of Madura, which included seven missions, preaching, converting, and baptizing multitudes, at the cost of privations, hardships, and persecutions. In 1682, struck by his success and his sanctity, his Jesuit Superiors entrusted to him the government of the entire province. To the wars of the local kings, which created ravages, disorder, pillage and death for the people, famine, pestilence, and floods came to add to the devastation of the unhappy land. Both the days and the nights of Saint John were dedicated to bringing aid to the poor Christians and pagans afflicted by so many disasters. At times he took charge of entire populations which the wars had caused to migrate. 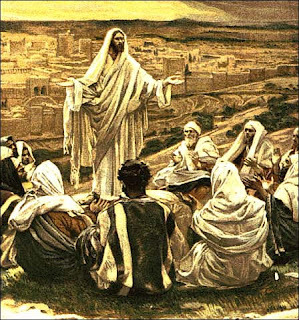 All the Christians were pursued by bands of robbers, paid by the ruling elements to prevent any increase in the influence of the disciples of Christ. Saint John’s miracles helped him, and God preserved him from the snares of his many enemies. After four years of this major responsibility, amid the anarchy which reigned, he was seized, tortured, and nearly massacred by the pagans, then banished from the local states. His Superiors sent him back to Europe to concern himself with the affairs of the missions of India. They wrote of him: He has affronted every peril to save souls and extend the kingdom of Jesus Christ, for whose love he has been captured several times and condemned to frightful torments. He preached in Portugal at the court and in the various dioceses and universities, without ever forgetting that he was a missionary of Madura, for which he recruited many generous workers for the Gospel vineyard. He finally went back to the land of his choice in 1690 with twenty-five Jesuits, of whom several died during the voyage. The king of Portugal took every means to obtain his return to Portugal, if not as tutor to his son, which post he had declined, then as bishop of one of the Portuguese sees, but the Saint was occupied in baptizing thousands of catechumens and instructing the pagans whom grace had touched. The brahmans were alarmed once more and conjured his death; he was tracked everywhere, but the envoys could not take him for some time. Eventually they succeeded, and his great enemy, a local ruler, exiled him with orders to imprison him and kill him secretly. But his execution by decapitation was carried out in the sight of a multitude of Christians who knew of his coming martyrdom, and who saw him pray in an apparent ecstasy, which checked the executioner’s courage for a time. They buried him and did not cease to pray at the tomb of this second Apostle to India. He was canonized in 1947 by Pope Pius XII. “Jesus said to his disciples: «Do not think that I have come to abolish the law or the prophets. I have come not to abolish but to fulfill. But whoever obeys and teaches these commandments will be called greatest in the kingdom of heaven. It is better for you to lose one of your members than to have your whole body go into Gehenna. But I say to you, do not swear at all; not by heaven, for it is God’s throne;nor by the earth, for it is his footstool; nor by Jerusalem, for it is the city of the great King. Anything more is from the evil one.” -Matthew 5:17-37.